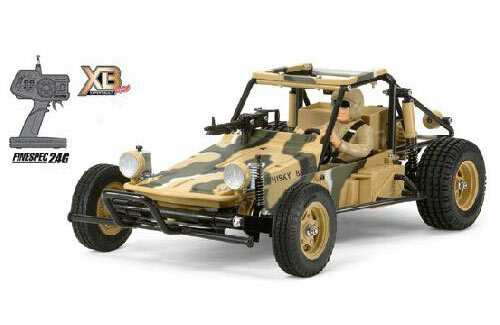 This is the 1/10 Ready-To-Run Expert Built version of the Fast Attack vehicle previously available as an R/C assembly kit. Finished and assembled durable resin body and roll cage are mounted on ABS resin bathtub type chassis. •Semi-pneumatic grooved front tires and rear tires with block pattern tread. •Finished soldier figure and M60 machine gun included. •Front and rear independent suspension. •Fully-enclosed gearbox protects against dirt and debris. •Includes Johnson/Mabuchi 540-J brushed motor. •4-wheel independent suspension consists of coil springs and trailing arms. •Finespec 2.4GHz R/C system is pre-installed. •TEU-105BK ESC (equipped with BEC) comes pre-installed. Item Name: Tamiya 1/10 XB Fast Attack Veh.